Sinn Féin President Gerry Adams has condemned so-called ‘dissidents’ in Dublin despite a rally in the city last weekend which saw several hundred republicans of all hues unite to march in support of interned political activist Marian Price. 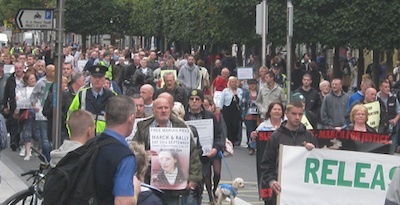 The march and rally, organised by the Free Marian Price Dublin Committee, also attracted the support of socialists, trade unionists and human rights advocates. Among those who took part in the rally were a number of members of the Dublin parliament, including Independent TD Thomas Pringle, who spoke at the rally, Sinn Féin’s Dessie Ellis and Socialist TD Clare Daly. Marian Price, a former prisoner, was originally arrested for holding up a piece of paper while a member of the breakaway ‘Real IRA’ read from it at an Easter commemoration some 18 months ago. She has now fallen seriously ill and is currently being held under armed guard in a Belfast hospital. The ‘Real IRA’ organisation has since merged with other breakaway groups, and is showing signs of increased activity after two small explosive devices were found in Derry today [Friday]. While Sinn Féin has supported Price’s release as a human and civil rights issue, it has repeated its opposition to the ‘new IRA’. Earlier this month, a military funeral was organised in Dublin for Alan Ryan, who was a senior member. Masked men fired shots over the coffin. A Garda crackdown against republicans in Dublin since that funeral, which was attended by over a thousand people, has led to charges against Ryan’s brother and two others for IRA membership. Mr Adams made it clear this week that the [Provisional] IRA has gone for good. But he dismissed the remaining armed republican groups as “mavericks”. “The IRA is gone,” he said on Tuesday. “We should not confuse those little maverick groups who paraded around this city recently. We should not confuse them with the IRA. The Louth TD was speaking just hours before a special debate in Stormont, where the DUP put forward a motion which called on the Dublin government to apologise for the emergence of the IRA in the 1970s. DUP leader Mr Robinson has insisted in recent weeks that there was a “clear connection” between the 26-County government and the Official IRA, which ended its armed struggle in 1972, and the Provisional IRA, which declared a ceasefire in 1994. The motion has baffled nationalists, but it was nevertheless passed by the unionist-dominated Assembly in Belfast by a single vote, 47 to 46, despite the opposition of Sinn Féin and the SDLP. Mr Adams insisted there was no connection between the government in Dublin and the IRA. He pointed to the history of repression and violence which republicans in the 26 Counties have long endured at the hands of the police, including the torture techniques practised by the Garda ‘heavy gang’. “The IRA is not the creation of any Dublin government,” said Mr Adams.